Marina Yanay-Triner of Soul in the Raw is a vegan blogger, educator, and recipe creator. She promotes a high-raw vegan lifestyle. Her goal is to show people how easy raw veganism can be, and how fun and creative it is to add more raw foods to their lifestyles. She began her vegan journey as a result of a powerful healing story in her family, and discovered her own body and a new connection to herself in the process; she was also able to heal her digestion. Marina’s brand new online course will be coming out this March. It will teach you how to improve your digestion through oil-free high-raw vegan meals. You can grab her 3 favorite vegan sauce recipes from the course here. Hello everybody. How are you doing? I’m Caryn Hartglass and you are listening to It’s All About Food. Here we are, it’s February already 2017 and what a year it has been so far. I like to always look at the positive things that come out of every event that occurs and it’s taking a lot more creativity to find the positive things that are coming out of things that are happening going on here in the United States but one of the good things is that I am finding more and more people are getting active and talking out speaking out saying what they feel and letting our officials know what they feel about how we should run our country. And from what I am hearing for the most part we are in agreement about many many things about life, liberty and the pursuit of happiness and I am hoping that this keeps up and maybe gets stronger. I have been an activist most of my life so this isn’t new for me but I’ve always had the feeling that if we have a roof over our heads and if we have enough food to eat, then we have really all that we need and we can be of service and help others. Now I want to take a deep breath will you breathe with me because I like it when we all do this together. It feels very empowering and relaxing. (breathing in once and out) Thank you for being here and for tuning in love. I want to bring on my guest. I am so grateful for her because she appeared just in the nick of time. So I will be speaking in a moment with Marina Yanay-Triner and she is a vegan blogger, educator and recipe creator. She has a website Soul In the Raw. She promotes a high raw, vegan lifestyle and her goal is to show people how easy raw veganism can be and how fun and great it is to add more raw foods to their lifestyle. She began her vegan journey as the result of a powerful healing story in her family, which I hope we hear a little bit more about in a moment, and discovered her own body and a new connection in herself in the process. She was also able to heal her digestion. Marina’s brand new online course is coming out this March. It will teach you how to improve your digestion through oil free, high raw vegan meals and you can grab her three vegan sauce recipes from the course right at our website Responsible Eating And Living, where we are advertising this show or you can go directly to SoulInTheRaw.com. Marina Yanay-Triner: Hi, I am so happy to be here and I love that breath that we started with. That was amazing. Caryn Hartglass: You love what, oh the breath. Marina Yanay Triner: The breath that we all took together, I actually wanted to start talking about breathing so that was perfect. Caryn Hartglass: Oh good. Let’s jump in and talk about breathing . It is one of my favorite subjects. I like to say there are some essential things that we need to do in life and the first thing is breathing. My partner Gary likes to say that he likes to breathes for a living. Marina Yanay-Triner: Yes it is so basic but we all forget it right? Caryn Hartglass: Yes especially when we are tensed or stressed, we hold that breath. We hold it in and that is not a good practice. Caryn Hartglass: So tell me what do you think about breathing? Marina Yanay-Triner: I actually wanted to talk about breathing when it comes to digestion because I feel like we always focus on food, which is totally important. I of course I think food is important but the relaxation around food is also really critical so one of the things I like to tell my audience is that before their meals they should take 5 deep breaths. For people who really love food so much and eat so many times a day it is perfect because then we are pretty much relaxed all day. But being relaxed around your meals is even more important in general because then you digest better. Caryn Hartglass: Absolutely and I know many people I have fallen for this recently because my schedule is very complicated right now. When I sit down for a meal and I am so hungry I just want to inhale it all right away and taking those few breaths is so important to just relax and slow down. Marina Yanay-Triner: Yes and be more mindful also about what you are eating and where it comes from and how it makes you feel. To eat slower that’s the big challenge for me. I know that and I know it is for a lot of people and that it makes their digestion problematic because we start digesting in the mouth. Caryn Hartglass: Absolutely, well let’s, this may not be in the order you want to discuss these things but I would like to go with the flow. We are doing the breathing flow right now. Digestion in the mouth. I can’t stress that enough. Can you embellish that a little bit? Marina Yanay-Triner: Yes, so I think carbs are the most important in terms of those enzymes in our saliva that are breaking down so we have to chew really well and that is where a lot of people fail. They just gulp down their food so if we start by chewing really well and taking small bites that’s really going to help. Marina Yanay-Triner: Totally, I realize because I love food so much and I love making delicious food and also having your electronics off like your computer and your phone and TV and everything is really really helpful also for your digestion because then you can focus on the food and can stop eating when you are full. It is a lot easier that way. Caryn Hartglass: I like talking about this and I talk about it periodically. I think it is important to bring it up regularly because we forget, we all forget and I need reminders so I think everyone else does too. I like to tell people especially when they are having smoothies, to chew. Marina Yanay-Triner: Yes, that is a great point because we think it is a drink but it is actually food. Caryn Hartglass: Yes, we need to digest a little in the month. The nice thing about slowing down, breathing before you get started, thinking about how grateful you are for what you are about to eat and then taking small bites, it lasts so much longer. Marina Yanay-Triner: Yes, that is so true. Caryn Hartglass: I am not a religious person how many times have I said this on this program, but I do see value in the ritual of saving grace before eating and we don’t do it all the time. Occasionally we get into a routine of doing that but I see healthful benefits of doing something like that. Marina Yanay-Triner: Yes. And it is in so many religions where we say grace or until you actually bless every single thing you eat and yes I think it is beautiful. There is a lot of wisdom in there that just makes you live in the moment and focus on the moment. Caryn Hartglass: Not just what you eat, but how it got to your plate. There are so many people involved with every thing that we eat. It’s just mind-boggling today. Marina: Yes and we have it so easy. Caryn Hartglass: We do have it easy. Yes. It always surprises me how people think it is difficult to prepare food in the kitchen and just think, you didn’t, for most of us, you didn’t have to seed it or grow it and prepare the soil and harvest it and weed it and all that stuff before it came into your kitchen. Marina Yanay-Triner: To me it almost a miracle because to be honest I am great with making food but growing food has been so challenging so far. So it is something that I definitely want to learn. I have a little garden and it has been really a big challenge so to me if it is almost like a miracle what those farmers do. It is pretty amazing. Caryn Hartglass: It is. There are some online courses and websites that, I don’t have them off the top of my head but if you are interested I can send them to you. But to anyone who is interested but there are some really good ones where people are sharing their insight about gardening especially in different environments because it is not the same everywhere. I mean you don’t want to reinvent the wheel. People have figured this out already. Marina Yanay-Triner: Yes. John Koller is awesome for that, Growing Your Greens. Caryn Hartglass: Okay, let’s back up a little bit and tell us your story. Your vegan journey. Marina Yanay-Triner: My vegan journey. So, I’ve been vegetarian since I was 20 and I am almost 29 so it’s pretty crazy how long it has been since I have had meat. I started out pescatarian actually and I sort of did it for the animals and also in a way for religious reasons. Weirdly enough I am not very religious, but I was working a lot with holocaust survivors and just learning a lot about the holocaust at the time and I sort of wanted to honor their memory in a way and just keep kosher. Then I was thinking it is so much easier to keep kosher when I just don’t eat meat and I don’t like it and I don’t want to kill animals anyway so that is sort of how it started. Kind of a strange story and I did not think about health at all back then and then my mom healed herself, I mentioned that to you. My mom had this chronic disease called interstitial cystitis and if anyone here of your listeners are struggling with this I would love for them to watch the video that I did with her on YouTube on how she healed it because she just explained it in great detail. It is such a powerful story because she was sick for eight years and this disease is horrible. It feels like needles in your bladder and she had very severe pain. Have you ever heard of interstitial cystitis? Caryn Hartglass: I have actually. Yes. Marina Yanay-Triner: It is kind of in the Crohn’s that kind of family. So she was really suffering and I honestly lost my mom for those eight years. She couldn’t talk to me. It was really awful and I was actually living in Jerusalem and every time I would come home and visit her, she could not speak to me at all. She couldn’t carry on a conversation so that really encouraged her to do something about it because everything that the doctors were offering really wasn’t helping. It would help for a moment but it wasn’t a solution for her. So she started researching and looking around for what other people did to heal in general and she found water fasting and raw foods. If you would have told me five years ago that I would eat raw, I would say you are crazy. There’s no way but just seeing her example was so powerful and that’s why I always tell people to have that intention in mind what is driving them because the example of my mom even from not being able to stand up straight because she was in so much pain she just couldn’t even stand up, she couldn’t leave the house to go hiking to even living a life to just having a normal life. It was such a big inspiration to me so that’s how she motivated me to also start my own health journey. Caryn Hartglass: Wow, that is such a great story. I haven’t shared any interstitial cystitis stories on this program so this is the first and don’t try and say that three times fast . Marina Yanay-Triner: Yes I always used to say it wrong and my mom would always correct me until I had to say it so many times that the classes that I would teach I got it down. Caryn Hartglass: Good, Well that is a great story and a great message to everyone that we are responsible for our own health and healing. Caryn Hartglass: The medical community, a lot of them do wonderful things and we can’t live without them literally but we do have to realize that it really is up to us. We can’t just put our lives in someone else’s hands. I personally, in my life, never felt control over my body. I never connected that I could do something to heal myself or to feel connections in myself. I actually have a past trauma with sexual assault and so that was a big lesson in that I can have control over my fate and how I heal and how I feel on the inside so that was really really cool. Caryn Hartglass: Very cool. And I can’t stress enough if you are going through something however simple or complicated, dangerous or just chronic it may be, if a doctor or a medical professional says that they can only do so much, that they can’t heal you or cure you, you need to find other help and go with your gut. I think our guts have a lot of intelligence and there is more to that expression than we really understand. Marina Yanay-Triner: It’s actually scientific. It’s not even you know some woo-woo thing. It’s totally scientific of how really smart they are and how much they control our immune system, our mood, our brain, everything. Caryn Hartglass: I believe that. Marina Yanay-Triner: I mean my mom would have never, she almost lost hope. She was feeling so hopeless when she would go to the doctor and they would give her injections of these really powerful drugs and for half an hour the pain stopped and she was so elated and so excited. She was hugging the doctor and then half an hour later it was the same thing. She was reading about 18 year old girls who were having their bladder removed because of this disease and then the disease would go to another spot would go to their colon or another area of their body. It was really horrible to think that she would be in this much pain for the rest of her life. So I am so grateful that she was able to push through water fasting for 28 days on water. Caryn Hartglass: Let’s talk about water fasting. I did a water fast for three weeks about 15 years ago just for the fun of it. Marina Yanay-Triner: That was fun. Caryn Hartglass: I actually did enjoy it. How did she discover water fasting and what was her experience like? Marina Yanay-Triner: She was just reading online and actually when we lived in Israel when I was little we had a cleaning lady who became a part of our family and she told us a lot about natural healing, that whole school of thought. My parents actually started eating that way for a while, it wasn’t vegan at all. But they were feeling better than they did when they would have processed foods so just that whole idea of healing naturally was something that my Mom already was kind of in the back of her mind. So it wasn’t new to her and she was reading people’s healing stories and reading about water fasting and I guess she connected the dots and kind of realized that if I let my body rest, let my digestion rest, because digestion takes 70 percent or more of our energy, then my body can heal. Honestly I don’t know how she did it while being in pain and thinking all of this and deciding it but we all supported her and my dad and I supported her so that must have helped her too. Caryn Hartglass: I was wondering did the pain get easier as the fast continued? Marina Yanay-Triner: Yes well she told me in detail when I interviewed her that yes. It’s actually a three-part interview for anyone who wants to watch. She talks about the whole scene, what she ate before, and after and what she eats now. But basically in the beginning it was really bad, she said it felt like needles in her bladder it was terrible for a few days, and then it gradually subsided, and so that really kind of gave her motivation to keep going. Caryn Hartglass: Well she is a very brave, courageous person and I am glad that she was rewarded for her efforts. Marina Yanay-Triner: Me too. It impacted me and the whole family and some many other people. Caryn Hartglass: I had a relatively easy fast because I went into it as a pretty clean vegan at the time and it was just getting over that hunger which took about two and a half days to finally not feel hungry. But there were other people at the fasting house that really had a lot of problems and the fast was difficult because as you are going through it you are getting, you are doing some serious detoxing and your body is letting all the toxic stuff leave the body and that can hurt. Marina Yanay-Triner: Yes it is funny that you say two and a half days because three days and I felt no hunger so the hunger wasn’t the problem it was her specific organ detoxing but it is exactly as you say it depends on what people ate before so if their body is pretty clean it shouldn’t be so difficult. But if they are eating processed junk food before then it can be pretty hard. Caryn Hartglass: Were you born in Israel? Marina Yanay-Triner: I was born in Ukraine and then I moved to Israel when I was two until I was twelve. Then I moved back to the United States and then back to Israel and then back to the United States. So it has been back and forth. Marina Yanay-Triner: Yes, the year you went vegan. Caryn Hartglass: How did you know that I went vegan in 1988 or you heard that somewhere I guess. Marina Yanay-Triner: I read it on your website I think. Caryn Hartglass: And do you know where I went vegan? Caryn Hartglass: There you go so that is why I asked you where you were born. I was working for an Israeli company and I was in Israel for three months and I was just getting ready to be vegan. I was going through how can I give up this and that, cheese and butter and I wanted to do it and I thought well I am traveling and I am on my own a lot and that’s when I am going to do it. So I went vegan in Israel in 1988, the year you were born. Marina Yanay-Triner: That’s crazy. Wow. Caryn Hartglass: And it was easy. Because there are so many wonderful salads. There’s always hummus. 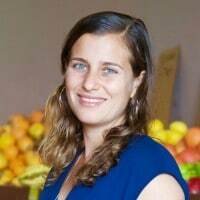 Marina Yanay-Triner: Yes Israel is an easy place to vegan and now even more so. Caryn Hartglass: Because they know what is in the food. Marina Yanay-Triner: Yes, I mean you won’t find an Israeli dinner where there is not salad. There are always vegan options. It is really really easy. Caryn Hartglass: Yes so. Well, there you have it. And it is kind of fun to talk to somebody who was born in the year that I went vegan. Because I was in a way born again. Marina Yanay-Triner: Yeah, yeah, I’m sure. It ‘s an amazing thing. That ‘s very cool. Caryn Hartglass: So you have taken all this wonderful knowledge and you have put it together and you have Soul in the Raw, tells us what goes on there. Marina Yanay-Triner: So Soul in the Raw originally started as a hobby that I would just post recipes because everybody was asking, especially my mother-in-law, who is now pretty much vegan, I think, maybe she has eggs every once in a while. But my dad and mom in law and my partner’s twin brother are almost entirely vegan so they are very proud of that. They always say it is thanks to me because I was very patient and nice and would just bring them delicious food. We were originally 100 percent raw for a while and I was making a lot of recipes so I started putting it on there and then it turned into my life’s mission because I loved it so much and think food is also the way to heal everything, not just physically but emotionally too. So now it is a community online. My Facebook group is called Raw Soul and it is pretty active and I like to teach people how to better their digestion, like I was able to do and how to include more raw food, not 100 percent raw, but just the whole food plant based diet that has a lot of raw foods in there. Caryn Hartglass: I am looking at some of your recipes right now. They look pretty good. Marina Yanay-Triner: Yes they are yummy. They are pretty delicious. Caryn Hartglass: So you are advertising these three oil free salad dressings. I remember I think it was around 2004, 2005; I did an all-raw diet for about two years. I enjoyed it but I was kind of learning about the raw food movement. I think a lot of people were at the time and it has definitely evolved over time. But I was not doing it how I would do it today. So when I would go to raw restaurants the food was smothered in olive oil, loaded with nuts, topped with Nama Shoyu. It was salty, oily and fatty and that didn’t feel very good. Marina Yanay-Triner: Yeah, yeah it is so funny. Because people think that any thing that says raw is healthy and so did I in the beginning but I have learned so much since then about what is actually research proven to be healthy. Listening to Dr. Greger a lot and really learning what is healthy food and of course that’s fruits and vegetables and roots and starches and things like that. But the cool thing about raw food is all the flavor and the sauces that I love to make so much. There are ways to make them healthy and with less oil and less nuts. So that’s kind of my passion. Caryn Hartglass: I am laughing here looking at some of your wraps that you call, I don’t even know how to pronounce it, wrawps, wraps. Marina Yanay-Triner: Yes that is actually a brand and they make raw wraps that are really good and I love to use them. Caryn Hartglass: Okay what are some of the favorite recipes. Marina Yanay-Triner: I actually wanted to teach your audience the way that I make my sauces if that’s okay with you. Marina Yanay-Triner: So the most important thing is I avoid oil and if you want to we can talk about some of the reasons why especially for digestion. I know a lot of people struggle okay so should start with that talking about why we should avoid oil in general. Caryn Hartglass: Yes. A lot of people get these expressions beyond surprise, what, no. Marina Yanay-Triner: I know, I know. I get that all the time “but olive oil is healthy and coconut oil”, no. Yes, I am actually having a lot of fun talking about that with people because I love teaching new information. I remember when it was new to me. It makes so much sense. I actually even watched yesterday how olive oil is made and if you watch that or canola oil, which is definitely horrible to watch, because there are so many chemicals in the process. Caryn Hartglass: I have to clarify not organic canola oil because organic canola oil is not made the same way. Marina Yanay-Triner: Right right. I was watching the conventional. Even if you watch the oils that are made in a better way the production that is a little less process or refined, you still watch all of the fiber and just the oil is going to waste. Just having the fat pressed out of it so that it ‘s 100 percent fat. And all of the fiber is gone and we know that fiber is not just the fiber; it is also all of the nutrients that come with it that they throw away. I really like to tell people to look at the nutrition facts on the bottle because you can see it says fat, carbs and protein, zero for two and 100 percent for the fat which there is no whole food or real food in this world. Even fruits and vegetables have all three. So that is how you kind of know it is processed and that you are not getting everything you could be and it is a lot of calories too. The reason that it impacts digestion is really interesting because we, especially as vegans, we have to have enough omega threes. Most people don’t really emphasize. So that really increases inflammation and causes weight gain and bloating and things like that. And it is also a cause for sluggish digestion because when you are having something that is 100 percent fat, it is harder to digest. And then of course it has been linked to heart disease in the research because it impacts our arteries. So I think those are really powerful reasons to stop eating oil. When I did I felt a huge huge difference in my digestion. Caryn Hartglass: Very good. All right, so let’s hear about some of your sauces. Marina Yanay-Triner: Yes, so everybody can go ahead and download those three that are my favorites. Actually they were picked in the Facebook group because in the course there are fifty-two, so I just picked three that were pretty great. But all of them are very very easy to make and they taste great. I want to tell you the seven steps so I am a really big systems girl. I like systems and I thought of seven steps that you think of when you are about to make a dressing or a sauce or a dip and the only way that those three are different is just the water content. But other than that, these are the steps. So the first one is your vegetables. You can use tomatoes or cucumber or zucchini or whatever fresh vegetables as a base and I use that to have less fat in the recipe. So tomatoes are some of my favorites and then if you don’t know what to use then always go for zucchini because it is pretty much favor less. thickener and flavoring. And the thickener is chia seeds and flax seeds and that’s how I balance the omega three I added in there. You probably know that the flax seeds and chia seeds really swell up, they take in a lot of liquid, they thicken your dressing that sticks really well to your lettuce. The last one is just spices or any flavoring that you like, ginger, garlic, that kind of thing. So that’s the formula. Caryn Hartglass: That’s genius, that’s genius. I love it. I’m thinking I would use steamed zucchini because I find it to be sweeter than raw zucchini. Marina Yanay-Triner: Yes it is, it totally is. I just like the raw one when I want it to be flavorless but I want the volume so I can just put the tiniest amount of nuts and seeds and then with the raw zucchini. If you want to make cashew cheese or something that you want to have white, then you can just peel it and then it will be a white, much lower fat sauce. Caryn Hartglass: Wow. That’s awesome and it has lots of fiber. Marina Yanay-Triner: Yes definitely and you just blend it all together which I forgot to mention but you throw all these things in a blender and it takes five to ten minutes and it is done. Then your meals are so much more flavorful. Caryn Hartglass: I like that. I tend to blend water with nuts or seeds and a little citrus that is like the fast. But I like the idea of adding zucchini, I am excited about that, I’ve got to try it. Very good. Thank you for that. Marina Yanay-Triner: Sure I hope everybody tries it at home and gets creative. I like to use whatever I have on hand and just play around with it; it is a lot of fun. Caryn Hartglass: All right, now you have an online course that is coming out in March. Tell us. Marina Yanay-Triner: Yes in the course I am teaching this method in much more detail and then also giving fifty-two recipes for salad dressings, dips and sauces that people can make that are tested and also meal ideas. So how I like to make my meals is that I make a sauce that will last two or three days and then use it for my main meal a few times in different ways so that it really really saves time once it is ready. So I am giving people three weeks worth of those main meals and also teaching them how to soak and prep nuts and seeds and beans that really really helps digestion. Just a way to really get better digestion and still have really flavorful food. Because we don’t want to lose that aspect of it. Caryn Hartglass: No and when you eat this way and your palate gets cleaner, it’s even more flavorful than you could ever imagine because your taste buds become clean. I like to say you don’t know how good you can feel and you don’t know how great this food can taste. Marina Yanay-Triner: Yes, I love that but to be honest with you, I’ve also said and my omnivore friends and my super picky friends, I have all sorts, and they’ve all loved it and they like to come over for this kind of food. So yes you are right, I guess when you start eating cleaner foods that way you are definitely tasting even more of all the flavors. Caryn Hartglass: You know what else I think, so many people are lost in the kitchen and don’t really know how to prepare food or prepare good tasting food that when they are invited to eat some food that has been prepared for them, even when it is vegan or raw, it’s delicious. They are just not use to fresh good food. Marina Yanay-Triner: That is so true. They are used to a lot of processed food. Caryn Hartglass: Yes, bringing it home. Marina Yanay-Triner: Yes and my favorite thing about my kitchen is that there is no processed food. It’s a lot more fun and easier to avoid when you don’t have it in your house. Caryn Hartglass: What does your kitchen look like? Marina Yanay-Triner: I wish I could do a video. I have a ton of spices. That is kind of my key thing. Everybody laughs when they see my spice drawer. I have a nice pantry. It has a lot of different all these things all things that give flavor to food and of course fruits and vegetables. So most of my kitchen is fruits and vegetables and there are beans and quinoa and amaranth and millet and all that good stuff in the fridge or freezer. Because that’s where we should keep them. They oxidize easily, not outside. Caryn Hartglass: Yes thank you for bringing that up. I can’t repeat that enough. People are always surprised to hear that too. Marinna Yanay-Triner; Yes, yes, yes and your nuts and seeds all that stuff goes in the fridge or freezer. Caryn Hartglass: Yes, you’ve got to do that. Okay, what else do you want to mention about you and Soul in the Raw that we haven’t touched upon. Marina Yanay-Triner: Soul in the Raw, I would just really want to invite people even if you don’t buy the course to come and join the community that is on Facebook that is Raw Soul and just ask your questions and get supported. It is definitely a journey. I think my message is to just be really really patient with yourself, with the food and believe in it. Because there is no other amazing diet out there that is so backed by research and stories of people healing things. So just give it time and be patient and I don’t know how many years being sick and then we can’t expect that within a week we are going to get better right away. So it takes time but it is so worth it, so worth it. unique. We all have a unique history. We all have a unique make up and we respond differently. So it takes some people more quickly to heal and recover. It takes other people longer. I know for myself, I’m a long-term vegetarian and vegan and after being vegan for 20 years or so I was diagnosed with advanced ovarian cancer and I went through chemotherapy. It took a year for the side effects of chemotherapy to leave my body and that was with lots of green juicing and lots of detoxing, green foods and it takes time. But it works, be patient. Marina Yanay-Triner: It does. I think it is important that you brought up that you were sick after being vegan because another belief that I also had but I rethought that is that if you are vegan you will never get sick and it is a panacea for everything and that you will have perfect health. There is a lot of pressure out there for vegans to always look perfect, feel perfect, and people look at us and say “Oh you have a cold you need to go back to eating meat” and that’s just not true because health is so much more than just food. I mean food is a huge part of it but there are so many more aspects to it. So I think we need to take the pressure off a little bit and know that we can get sick, but we can always go back to health through the food, through the breathing and the good mood and the meditation and all those important things. Caryn Hartglass: I agree. Thank you so much for summing that up so beautifully. And I really appreciate you appearing in my life recently and wanting to come on this program. You saved the day for me and it was a pleasure talking to you. So I wish you a lot of good luck with Soul in the Raw. Thanks for joining me on It’s All About Food. Marina Yanay-Triner: Thank you for having me. Caryn Hartglass: Okay be well. Thank you. Marina Yanay-Triner: You too. Bye. Caryn Hartglass: Okay bye bye. That was Marina Yanay-Triner of Soul in the Raw. Let’s take a quick break and we will be right back in a couple of minutes.